Columbus, Ohio-based GivenHansco, developer of the award-winning line of Keystone integrated software products for ready mixed, aggregate and asphalt producers, recently announced an exclusive dealership arrangement with Barnes Industrial Group. “We are extremely excited to have the Barnes Industrial Group as our exclusive dealer in the Midwest. Jim [Amelung] and his group have deep industry knowledge and are committed to exceptional customer service just as we are,” says GivenHansco President Mike Sanders. Barnes Industrial Group is an established distributor in Manchester, Mo. 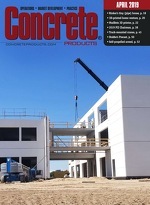 ; Con-E-Co concrete plants its leading equipment brand. “Partnering with GivenHansco will allow us to offer our customers a truly integrated product line that we have not been able to before. Along with batch controls, we can now offer accounting, dispatch and GPS solutions from a company with industry-leading customer service,” says Barnes Industrial President Jim Amelung. Aaron Lian has joined Schwing America as vice-president/general manager of Ready Mix Products, bringing 20-plus years’ experience in engineering and manufacturing, plus expertise in global business management and new product development. Prior to Schwing America, he was the managing director of a division of ESCO Corp., an independent developer and manufacturer of highly engineered wear parts and replacement products used in mining, infrastructure development and industrial applications. Mack Trucks named Martin Kleker regional vice president for the U.S. Central Region, responsible for driving sales, market share and profitability. Kleker has more than 25 years of experience in the transportation industry, with expertise in sales, finance and parts and service. He also brings product knowledge to the position, including aerodynamic vehicle technologies focused on fuel efficiency and alternative fuels. Kleker most recently served as vice president of sales for National Accounts at Navistar, and previously led sales and service teams as regional manager and national fleet sales manager for Peterbilt Motors Co.
Insteel Industries Inc. in Mt. Airy, N.C., has announced a $36 million deal for the prestressed concrete strand business of Ohio-based American Spring Wire Corp. Under the terms of an agreement effected through the Insteel Wire Products Co. subsidiary, Insteel will acquire the accounts receivable and inventories related to ASW’s PC strand business; a Newnan, Ga., production facility and equipment; and, equipment at a Houston operation. Insteel will continue production in the latter under a lease with ASW. For the twelve months ended June 30, 2014, ASW’s sales of PC strand were $67.8 million.